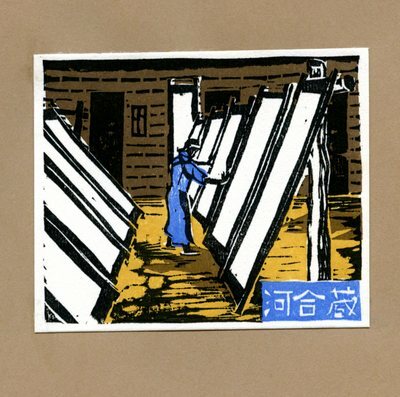 Woodblock bookplate in four blocks: light blue, brown, black and dark yellow ink with a white border. This image is an abstract image of a person in a room painting on large canvases. Text is in Japanese. "Takao Hiwasaki Bookplate" (1963). Japanese Bookplate Collection. Image 58.